Regular readers of this blog already know I've been finding homes for a lifetime's worth of quilting treasures for an elderly friend....a 7' x 7' storage pod arrived on my driveway in April. The deepth of her collection was astonishing....all top notch quality fabrics....not to mention the variety. Here are some special groupings at rock bottom prices...perhaps one of you might be interested. SOLD - This is being sold as 1 lot. Hard to find brown, original cotton 'Three Cats' printed and purchased in England in the late 1970's. 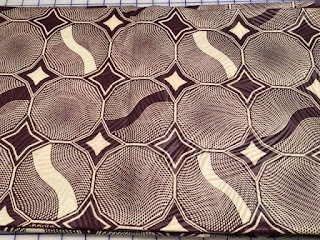 Newer Shweshwe fabric is produced by Da Gama Textiles in South Africa. This lot weighs 1 lb. 2 oz. 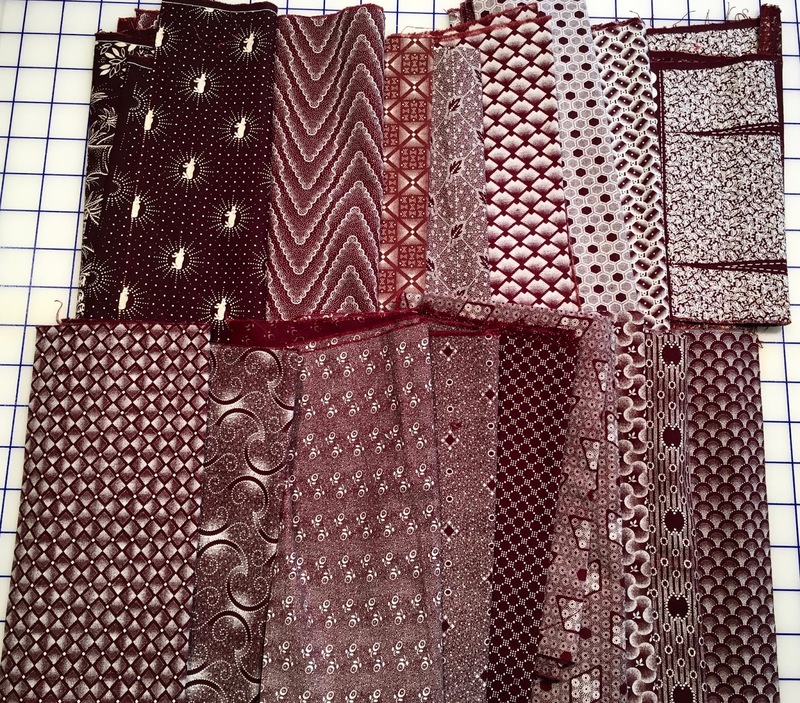 with 14 pieces that are a little shy of what our fat quarter would measure, (1 has a 6” piece cut from it), two longer narrower pieces, & 3 that about 1/2 of a fat quarter. 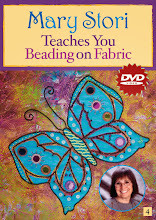 This product is expensive and hard to find in the US...except perhaps very small pieces in some specialty booth at large quilt shows. Being sold here at about $2.50 a piece, far less than half of retail (even if you can find it) in the hopes someone will create something beautiful from it......I'm simply too overcommitted to do it myself! PayPal payment within 12 hrs. Ships via USPS flat rate priority @ $7.25, the next business day if possible. Smoke free home. Email me using link on right side bar to claim the item. US sales only. $45 - Being sold as 1 lot - Real Dutch Wax block print cotton fabric - a 6 yard piece - original labels still in place. Colors dark brown and ivory. Unusual wax application provides a textured shine almost like feathers. I've never seen another one like this. Estimated purchase date in the mid 1980's in Holland where it's printed for the African market. 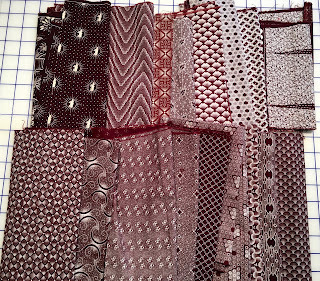 SOLD for all 8 1/4 yards for one low price. 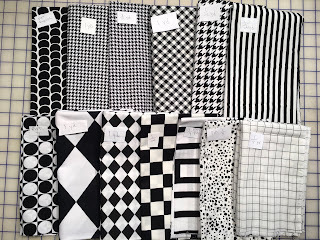 Quilt shop quality black & white geometric cottons. 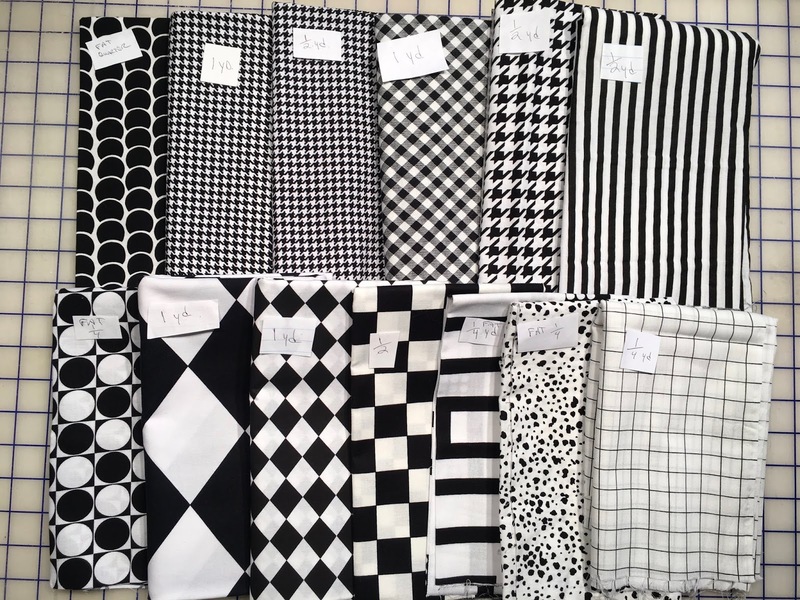 12 different patterns. PayPal payment within 12 hrs. Ships via USPS flat rate priority @ $7.25, the next business day if possible. Smoke free home. Email me using link on side bar to claim the item. US sales only. 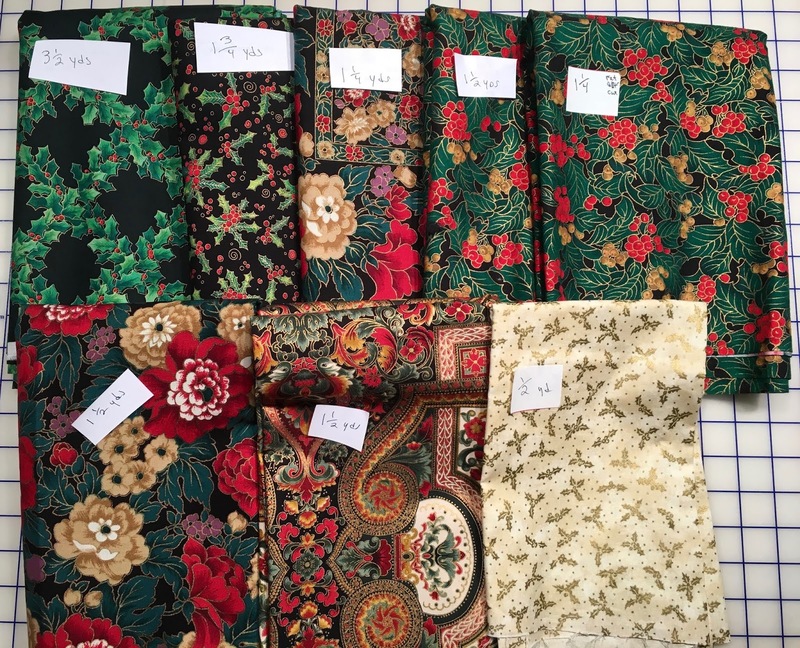 SOLD - Selling 11 1/2 yards as 1 lot...plenty of yardage for table cloths, napkins, gift bags, quilt backings, just to name a few. Mostly Hoffman and Kaufman screen prints. 7 different prints - all feature gold metallic accents. You can probably buy cheaper Christmas fabric, but not this quality....make your sewing time count! Row #1: 3 1/2 yds, 1 3/4, 1 1/4 1 1/2, 1 1/4 * measurement reflects the fat quarter piece cut from one end. - note: the last two pieces are the same design.